Frequent visitors to Green Spring Gardens Park recognize its gazebo as a charming fixture that has served as a stage for concerts, a backdrop for weddings and a meeting place for a wide variety of educational programs over the past 25 years. Now, thanks to Clark Construction volunteers, the aging structure has been renovated with modern-day materials, such as composite decking, that can better stand the test of time. Diehl says community service projects are an integral part of his company’s culture, and he learned about the need at Green Spring when he contacted the Fairfax County Park Foundation. 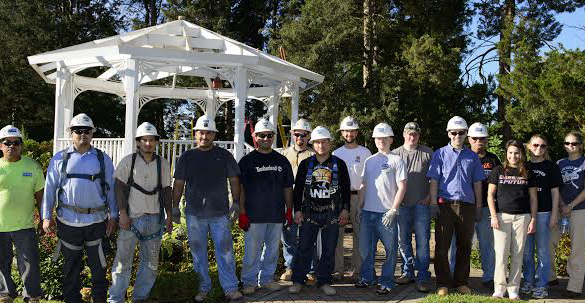 More than a dozen skilled Clark Construction employees assigned to a Dulles Airport project recently sacrificed a Saturday off to reconstruct the roof, railings and decking of the Green Spring gazebo. They provided the elbow grease, time and know-how while partnering with the Park Authority and various subcontractors to provide tools and materials. The newly renovated gazebo also includes a new ramp, making it accessible to all visitors. 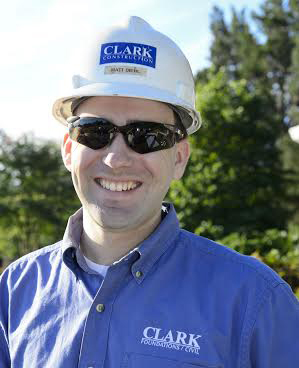 Clark employees volunteer hundreds of hours of community service each year in a wide variety of activities including serving meals to the homeless, teaching in elementary schools, building playgrounds, and cleaning parks and community areas. Now, thanks to Clark Construction volunteers’ generosity, Green Spring Gardens Park goers can enjoy the new gazebo for generations to come.